Download the Foodie Cab app today! 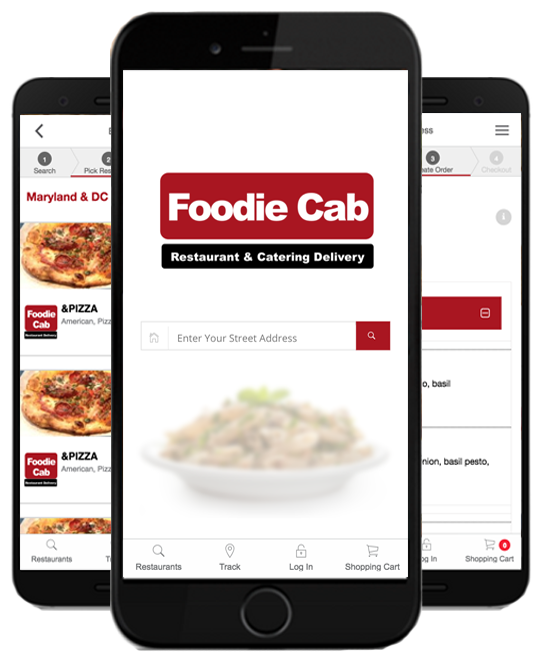 Foodie Cab is the area's newest restaurant and catering delivery service in the DMV area. A foodie is a person who has an ardent or refined interest in food. We have combined our passion for food with our love for great customer service to provide you with the best food ordering experience ever. We offer food delivery from over 90 restaurant partners and adding more every week. Please check our list often. Some of our fine partners: California Pizza Kitchen, TGI Friday's, Zoës Kitchen, Freshii, Burger Joint, California Tortilla, Cameron Seafood, Crisp & Juicy, Baja Fresh, Booeymonger, Mamma Lucia and many, many more. We coordinate delivery for residential and corporate customers. We offer residential delivery in the following neighborhoods: Bethesda, Chevy Chase, Rockville, Potomac, Silver Spring, Gaithersburg, Germantown and parts of Washington, DC. Our call center is open Monday through Friday, 9am-5pm. You may place orders online anytime. Whether you are craving Burgers, Wings, Breakfast, Asian, American, Chinese, Crepes, Deli, Greek, Mediterranean, Kabobs, Indian, Mexican, Latin, Peruvian Rotisserie Chicken,Pizza , Ribs, Italian or Seafood; we got you covered. Lunch Boxes are available too. Our catering delivery services are excellent. We go beyond just being a delivery service. We develop menus for each client, help you stay within your budget, help you pick the right combinations, coordinate with the restaurant of your choice to confirm, package, pick up and deliver your delicious catered meal at your requested time. Our catering gurus are available to help put together a great experience for your group, Monday through Friday 9am to 5pm. Call us at 240-558-3506.